The Indians are described as "a renegade group of Apaches." They're compared to desperadoes and rustlers. They don't seem to do much except attack, chase, fight, and kill. Reese notes what's wrong with this:The author's note says that they relied on Love's autobiography for the material they used to write Best Shot in the West. I wish they'd used it more selectively, or, that they'd figured out how, in their narrative, to put some context around Love's words about Indians. Why were the Apache men attacking settlers? Were those settlers on land that didn't belong to them? What had the settlers done to the Apaches? As-is, the take-away about Indians is that they were all just bad. My take-away? The all-bad Indians ruin the story. 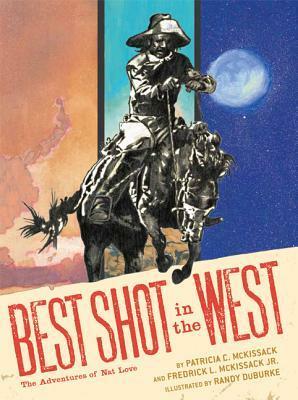 I can't recommend Best Shot in the West. 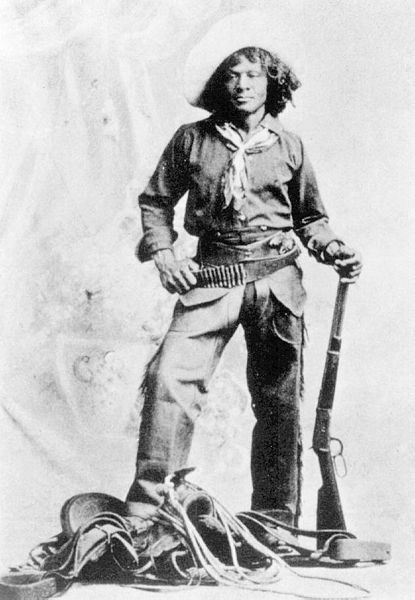 Nat LoveIn October 1877, he was captured by a band of Akimel O'odham (Pima) while rounding up stray cattle near the Gila River in Arizona. Love reported that his life was spared because the Indians respected his fighting ability. A while after being captured, Love stole a pony and managed to escape into West Texas.The text of Love's autobiography, The Life and Adventures of Nat Love, is online. It gives us the best account of Love's interactions with Indians. His first encounter with Indians:Not far from Dodge City on our way home we encountered a band of the old Victoria tribe of Indians and had a sharp fight. These Indians were nearly always harrassing travelers and traders and the stock men of that part of the country, and were very troublesome. In this band we encountered there were about a hundred painted bucks all well mounted. When we saw the Indians they were coming after us yelling like demons. As we were not expecting Indians at this particular time, we were taken somewhat by surprise. We only had fifteen men in our outfit, but nothing daunted we stood our ground and fought the Indians to a stand. One of the boys was shot off his horse and killed near me. The Indians got his horse, bridle and saddle. 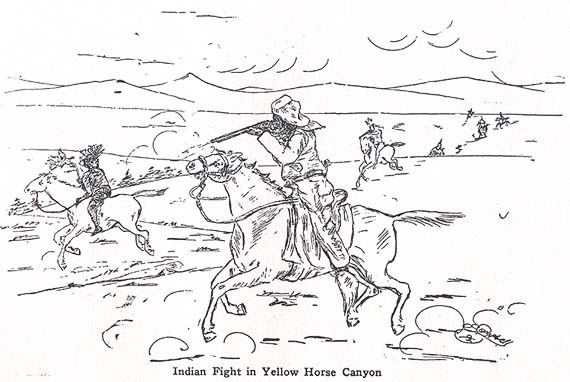 During this fight we lost all but six of our horses, our entire packing outfit and our extra saddle horses, which the Indians stampeded, then rounded them up after the fight and drove them off. And as we only had six horses left us, we were unable to follow them, although we had the satisfaction of knowing we had made several good Indians out of bad ones. This was my first Indian fight and likewise the first Indians I had ever seen. I have no idea what "an old Victoria tribe" refers to. I doubt it's a misprint for "Old Victorios"--aka Apaches named after Victorio. Love's next significant encounter with Indians:We had on this trip five hundred head of mostly four year old long horn steers. We did not have much trouble with them until we struck Indian Territory. On nearing the first Indian reservation, we were stopped by a large body of Indian bucks who said we could not pass through their country unless we gave them a steer for the privilege. Now as we were following the regular government trail which was a free public highway, it did not strike us as justifiable to pay our way, accordingly our boss flatly refused to give the Indians a steer, remarking that we needed all the cattle we had and proposed to keep them, but he would not mind giving them something much warmer if they interfered with us. This ultimatum of our boss had the effect of starting trouble right there. We went into camp at the edge of the Indian country. All around us was the tall blue grass of that region which in places was higher than a horse, affording an ideal hiding place for the Indians. As we expected an attack from the Indians, the boss arranged strong watches to keep a keen lookout. We had no sooner finished making camp when the Indians showed up, and charged us with a yell or rather a series of yells, I for one had got well used to the blood curdling yells of the Indians and they did not scare us in the least. We were all ready for them and after a short but sharp fight the Indians withdrew and every thing became quiet, but us cow boys were not such guys as to be fooled by the seeming quietness.Indian Territory usually means Oklahoma. Which suggests these Indians were Kiowa or Comanche, not Apache. But that's just a guess. As Reese surmised, there's more to the story than simply "bad Indians." The cowboys were entering a region everyone agreed was Indian territory. They thought a "government trail" gave them the right to pass freely, but the Indians thought otherwise. Rather than kill the trespassers outright, the Indians demanded a toll, which seems fair enough. When the trespassers refused to pay, the Indians punished them for their trespass. Love's capture and adoption into a tribe:But finally my ammunition gave out, and the Indians were quick to find this out, and they at once closed in on me, but I was by no means subdued, wounded as I was and almost out of my head, and I fought with my empty gun until finally overpowered. When I came to my senses I was in the Indians' camp. My wounds had been dressed with some kind of herbs, the wound in my breast just over the heart was covered thickly with herbs and bound up. My nose had been nearly cut off, also one of my fingers had been nearly cut off. These wounds I received when I was fighting my captors with my empty gun. What caused them to spare my life I cannot tell, but it was I think partly because I had proved myself a brave man, and all savages admire a brave man and when they captured a man whose fighting powers were out of the ordinary they generally kept him if possible as he was needed in the tribe. 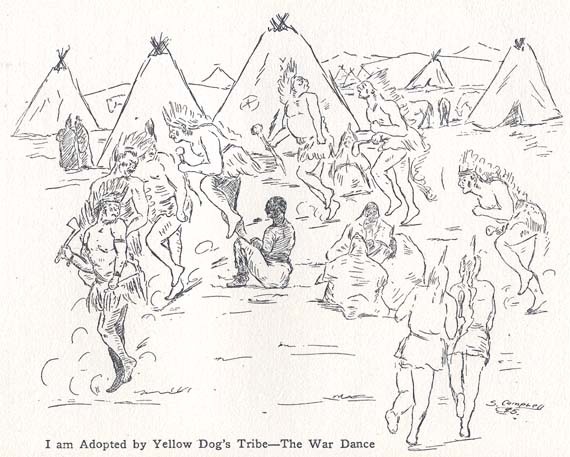 Then again Yellow Dog's tribe was composed largely of half breeds, and there was a large percentage of colored blood in the tribe, and as I was a colored man they wanted to keep me, as they thought I was too good a man to die. Be that as it may, they dressed my wounds and gave me plenty to eat, but the only grub they had was buffalo meat which they cooked over a fire of buffalo chips, but of this I had all I wanted to eat. For the first two days after my capture they kept me tied hand and foot. At the end of that time they untied my feet, but kept my hands tied for a couple of days longer, when I was given my freedom, but was always closely watched by members of the tribe. Three days after my capture my ears were pierced and I was adopted into the tribe. So the first time Love meets Indians personally, they spare his life, dress his wounds, and adopt him into the tribe in a mere three days. Would a non-Indian have adopted an Indian captive after only three days? Probably not. Despite their frequent raids, the Indians seem more civilized than the trespassing white men. Note: I assume that whoever illustrated Love's autobiography based his drawings on nothing but his stereotype-filled imagination. You won't find Plains chiefs dancing in front of tipis in the Akimel O'odham (Pima) culture. If we take Reese's review literally, Best Shot in the West has two appearances by Indians and two mentions of them. Three of these four mentions are negative and one--the Yellow Dog bit--is arguably positive. Unfortunately, the positive one isn't as positive as in Love's autobiography. Best Shot in the West has Yellow Dog offering Love tribal membership. The autobiography has Love joining the tribe and learning its language and customs for a month. Nevertheless, Best Shot in the West seems to reflect the negative attitude of Love's autobiography reasonably well. Let's assume it does. Then the question becomes: Is it enough to adapt an old document accurately if the document itself is biased? My answer is no. Audiences have learned that old Western stories involving Indians are horribly unfair. The creators should do more than simply reflect and repeat that unfairness. If the creators feel Love's autobiography is an important record that shouldn't be tampered with, okay. But they still should do something. For instance, add some text pages to provide the Indians' point of view. That would balance the original narrative without changing it. For more on Indians in comic books, see Bora and Upa in Dragon Ball and Review of Road to Medicine Lodge. I don't know what to think about this Nat Love. He claims to have been captured by a Pima warparty that was out rustling cattle in 1877, then claims that he earned their respect and was allowed to marry the chiefs daughter and become a member of their tribe. I didn't realize Love's autobiography was online. Because of it, I've expanded this posting significantly. Best teen novels are white? Lauer calls Vieira "Indian giver"